The first round of the U.S. presidential debates were held this week. Whether people think that Hillary Clinton “won” that debate or Donald Trump “won” that debate is subject to their own interpretation. Perhaps that debate helped move the undecided voters to one candidate or the other. On this I will not speculate. One thing that was missing in my view about the presidential debate were two additional political parties that should have been there. These were the candidates for the Libertarian Party and the Green Party. After the Democratic and Republican parties, these two parties have the most votes and influence in the United States today. This is key—the Libertarian Party’s presidential candidate Gary Johnson is on the voter forms in every state of this country. Since this is the case, then why was he not allowed in the presidential debate? It begs the question why the Commission on Presidential Debates did not include the Libertarian Party and the Green Party in the debate. It would have given a chance (which I believe all credible presidential candidates SHOULD have) to air their views and talk about the issues. It seems that these presidential debates have become little more than beauty contests than on the issues that confront Americans day in and day out. What are the views of Green Party candidate Jill Stein on the issues Americans care about? We do not know because the Commission on Presidential Debates has purposefully excluded third parties. Real democracy is exercised when credible candidates from major third parties are included as part of the political process. 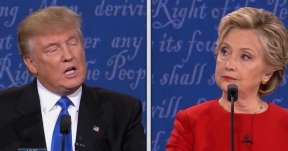 Leaving the presidential debates as the sole domain of the two governing political parties will seriously limit the choices Americans have. For now all I can do is see the debates and laugh out loud. © 7478 Chicago Hispanic Newspaper, Lawndale News, Hispanic Bilingual Newspapers, Su Noticiero Bilingue. All rights reserved. XHTML / CSS Valid.